Day 6: Kilometre 6 (all over the map and brain) in Red Shoes Rock. Stop FASD. Today is another scorcher, with humidity, here in Eastern Ontario. The kilometre walked was early this morning. Not too many people outside. Then it was a quick water of the garden. The plants are wilting in this heat. The weather and being in the garden gave me so many metaphors to the experience of living with someone who has FASD. For instance, my daughter’s brain and abilities are all over the map – like the weather conditions today across Canada. Ontario and the eastern side of the country are in another heat advisory. Whereas the west is cooler. Hard to believe they had snow out west earlier this week! Like one country with many weather patterns, one brain can have varying patterns of abilities. The maiden had an updated pych assessment this summer and it revealed the vast differences in her brain functions. She may be 17 years in chronological age but she does not have the same abilities in all areas of a “typical” 17 year old. She looks 17 and on the surface talks like most 17 year olds. She is funny, friendly and a pleasure to speak with. However if you speak with her for any length of time you will realize she is “much younger” in her interests, ability to process information and life experience. She reads at a grade 5 level but talks like a 25 year old. She can complete a word search puzzle but can’t find an object she is asked to look for. She can remember what time her computer will shut off (I’ve discovered Family Safety) but can’t remember what day her library books are due. She will dress up to go out but if I didn’t make her she wouldn’t shower or brush her teeth before going out. The challenge for parents and caregivers is to find the strengths and build on them. I need to acknowledge what she can’t do and remember to not put expectations on her she can’t meet – and at the same time I need to build her confidence and focus on what she can do. This graphic I saw on my Facebook feed today really struck a chord with me. 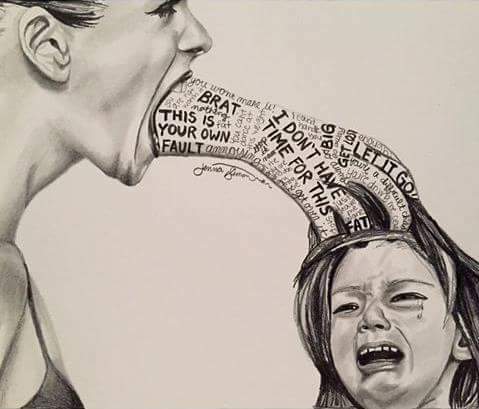 Everyone, parents and caregivers, friends and strangers, need to be careful about what words are sprinkled or showered on people. One of the hardest lessons I’ve learned is to stop saying phrases I grew up hearing. They hurt me. I don’t want to hurt my daughter. I have to be conscious of what I am saying. I have to be careful that my expectation of her is not higher than she can meet and then my frustration comes out in “you are 17”, “when will you learn” or “when will you stop doing” . I am still learning to try differently, rather than harder, a phrase coined by Diane Malbin. In Malbin’s book Trying Differently Rather Than Harder, she states: Understanding the role of the brain in FASD and the shift in recognizing the difference between non-competence and non compliance sets the stage for trying differently rather than harder. I still struggle with this some days. I fall back on old patterns of behaviour and speaking and expecting. Society still has some old patterns of behaviour to shift as well. Society needs to recognize that drinking alcohol during pregnancy causes permanent brain damage. The message needs to be clear and simple. No alcohol for nine months. 049 Society needs to support – without stigma – mothers that have consumed alcohol. Society needs to recognize not all disabilities are visible. We, as Society, need to encourage and support each other if we want society to grow. Day 7: Kilometre 7 Looking for new for Red Shoes Rock. Stop FASD.